Scotland’s Lord President Lord Hamilton. 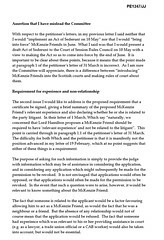 The embarrassingly long one year debate on how to formally introduce McKenzie Friends (non-lawyer courtroom assistants) to Scotland’s courts took another turn today as it emerged, LORD HAMILTON, Scotland’s top judge has told the Scottish Parliament he does not believe in using the term “McKenzie Friend” in a Scottish court, alleging that unrepresented Scots court users are too ignorant of ‘legal language’ and the courts system they would have no idea what a McKenzie Friend actually is. 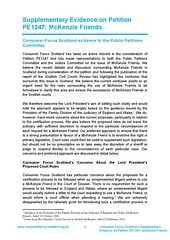 Lord Hamilton’s letter to Holyrood’s Petitions Committee (pdf), dated 22 April 2010, one day after the Committee had asked the Lord President for responses to points raised in last Tuesday’s Petitions Committee hearing, rounded on everyone in the McKenzie Friend debate, and went onto heavily criticise consumer organisations, law reform campaigners and even the petitioner, Mr Stewart MacKenzie for raising points of doubt over the Lord President’s somewhat overly protective plans announced in February, to introduce an Act of Sederunt to formally allow McKenzie Friends to operate in the Scottish courts. The increasingly bitter debate, marking the Scottish legal system’s miserable attempt to bring McKenzie Friends to Scotland’s courts compares negatively to the swift court judgement in the 1970 McKenzie v McKenzie court case in England, which established the right to use a McKenzie Friend court helper in English courts, a facility now used by unrepresented party litigants in many international jurisdictions. What took an English court one judgement forty years ago to achieve is taking Scotland’s combined legal & political figures more than a year with no end in sight. The year long peculiarly Scottish version of introducing McKenzie Friends, has so far seen the involvement of no less than two Scottish Government Cabinet Ministers, Justice Secretary Kenny MacAskill and the Community Safety Minister Fergus Ewing, several meetings of the Scottish Parliament’s Petitions Committee dating back to April 2009, a November 2009 ruling in the Court of Session by judge Lord Woolman who allowed Scotland's first Civil Law McKenzie Friend, the involvement of Scotland’s two top judges, the Lord Justice Clerk Lord Gill - who supports the introduction of McKenzie Friends via his Civil Courts Review and the Lord President of the Courts Lord Hamilton who has claimed at various stages of the debate McKenzie Friend style ‘lay assistance’ has always existed in Scotland despite no record of it being able to be produced by the Scottish Courts Service, has left Scots in general, and many unrepresented party litigants no further forward in seeing a clear set of rules on how McKenzie Friends can be used in the Scottish Courts. Law Society of Scotland oppose McKenzie Friends on grounds of lost business for solicitors. Also of note to the debate on McKenzie Friends, is the Law Society of Scotland's opposition to the entire concept of unrepresented party litigants having the facility of non-lawyer courtroom assistance. The Law Society and the Faculty of Advocates are apparently more worried McKenzie Friends & other access to justice reforms from Lord Gilll’s Civil Courts Review will impact on business for their members while losing the legal profession their long held control over who among us actually gets into court. 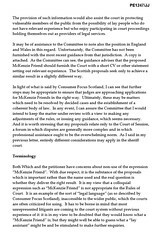 Lord Hamilton went on to inform the Parliament the latest version of the guidance on McKenzie Friends for England & Wales advises that the proposed McKenzie Friend should furnish the Court with a short CV or other statement setting out relevant experience. He claimed the Scottish proposals seek only to achieve a similar result in a slightly different way, although as documents from the English court authorities confirm the CV aspect of the guidance is ‘not as compulsory’ as what is intended for implementation in Scotland. 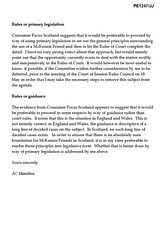 Lord Hamilton indicated in his letter to the Petitions Committee, he could still deal with the matter by way of introducing McKenzie Friends to Scottish courts via his proposed Act of Sederunt, to be discussed at the Court of Session Rules Council meeting on May 10 2009, although noting Consumer Focus Scotland had suggested it would be preferable to proceed using primary legislation to set out the general principles surrounding the use of a McKenzie Friend and then to let the Rules of Court complete the detail. He asked the Petitions Committee if he should defer any further consideration of the matter on his part until progress became clear on the issue. In a somewhat ambiguous conclusion, Lord Hamilton appeared to give preference to the idea of using the legislative process as indicated by a recent announcement from the Scottish Government of an amendment to Stage two of the Legal Services Bill, for the introduction of McKenzie Friends to Scottish courts. So there we have it, the Scottish Judiciary, the Scottish legal establishment, the Scottish Courts, the Scottish Government and the Scottish Parliament couldn’t manage in over a year what one London court managed in one judgement in a divorce action over forty years ago in 1970. If there is any indication our Scottish legal system needs much more than reforming .. probably a whole reboot, then this must be one of those perfect examples to show how far the rot goes, and what must be done to repair it. McKenzie Friends - We Scots are allegedly too ignorant to know what they are, but we are not necessarily too ignorant to be forced to stump up tens of thousands of pounds to lawyers, advocates & legal teams in the Court of Session for stringing out even the most simplest of cases to years or even decades long appearances with no clear result for clients, other than huge fees for the legal profession. An unfair system of access to justice, if ever there was one. Shame on those who preserve it. They have no standards, no decency. Labels: Consumer Focus Scotland, Fergus Ewing, Kenny Macaskill, Lord Hamilton, McKenzie Friend, Petition 1247, Scottish Parliament, Which? Lord Hamilton dubbed ‘too protective’ of Scottish courts. MCKENZIE FRIENDS FOR SCOTLAND moved a little forward on the road to progress at the Scottish Parliament’s Petitions Committee earlier this week as independent MSP Margo MacDonald expressed the views of many consumer organisations & campaigners that Lord Hamilton’s plans as announced earlier in February to impose strict conditions on the appearance of McKenzie Friends (courtroom helpers who assist unrepresented party litigants by taking notes, suggestion questions to be asked, and quietly advising on court procedures, points of law) were “too protective”, ignoring the decades of English legal experience in McKenzie Friends appearing in courts south of the border. In England & Wales, and most other jurisdictions where McKenzie Friends have been used in courts around the world for up to forty years, there are apparently no such requirements of the forcible signing of certificates for those wishing to appear as a McKenzie Friend, who is simply there to assist an unrepresented party litigant by taking notes, suggesting questions and giving quiet advice on court procedures or acts of law. Margo MacDonald interceded, commenting that it has been suggested by Consumer Focus that a simple question asked by the judge or sheriff are you being paid for this if the person ‘tells a porky’ he can be put away for perjury. 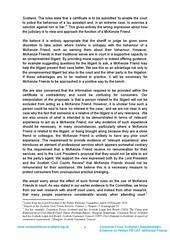 Oddly enough, Consumer Focus Scotland are against McKenzie Friends receiving payment for their services to party litigants, this despite the fact McKenzie Friends in England & Wales, and many other international jurisdictions have for years been able to charge for their services without much dispute from courts. However, today, some who have acted as McKenzie Friends in England & Wales questioned why Lord Hamilton has such a hang up over the issue of whether a McKenzie Friend can receive remuneration for their services. While the Scottish Parliament & consumer groups argue over whether a McKenzie Friend can or cannot receive payment for their services, apparently on the ludicrous possibility of penalty of jail time, there is now case law in the English courts family division to support the right of a McKenzie Friend to charge for their services, where Mr Justice Munby, ruling over a case of costs arising from contentious contact and residence litigation between unmarried parents [N (A Child)  EWHC 2096 (Fam)] concluded the child’s father's McKenzie Friend "is entitled to charge, if he can find clients willing to pay his fees, at an hourly rate which can hardly be said to be extravagant when contrasted with the fees one frequently finds being charged to privately paying clients in family cases". Clearly as I have thought all along, the issue of bringing McKenzie Friends to Scotland’s courts comes down to competition, and the fears of the legal profession they will lose business. Well, as far as I’m concerned, that's a good thing. If expensive legal teams are so expensive and so poor quality as we are forced to expect on a daily basis in the Scottish courts that they will often drag a case out for years, take it to all the courts in the land and achieve no success while presenting the litigant with bills for tens of thousands of pounds, then the legal profession deserve to lose the business. 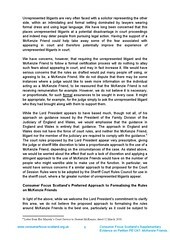 The prospect of lost business for lawyers should not factor into the Lord President’s decisions on when and under what format to allow McKenzie Friends in Scotland’s courts, especially since the legal profession have been so effective at excluding McKenzie Friends from Scotland for the past forty years, simply, due to … greed. What is your response to each of the concerns raised in the submission by Which? magazine, specifically in paragraphs 4 to 7 (PE1247/AA), the petitioner (PE1247/EE), particularly points 1.1 and 1.2 and Consumer Focus Scotland (PE1247/FF)? Will each of these concerns be addressed in the forthcoming Act of Sederunt you intend to bring forward? If not, why not? Law Society of Scotland in legal dispute with Scottish Legal Complaints Commission. As revealed earlier this week in reports of Ministerial interference with the Scottish Legal Complaints Commission, apparently ordered by the Law Society of Scotland to secure a decrease in the annual complaints levy solicitors are forced to pay for complaints regulation, the Law Society of Scotland have taken legal action in at least four instances against the Scottish Legal Complaints Commission. Community Safety Minister Fergus Ewing would rather the SLCC’s £1.5 million surplus be paid to lawyers instead of being used to stem public services cuts in the community. 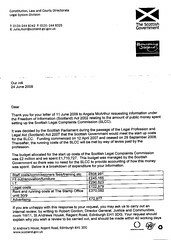 The Scottish Legal Complaints Commission have released limited details of the cases, by way of comments responding to the Community Safety Minister Fergus Ewing’s intervention directly on behalf of the Law Society in the budget dispute, which saw Mr Ewing go on to threaten the independence of the SLCC should it not comply with the Law Society’s wishes to lower the complaints levy. The battle over the complaints levy began when the SLCC revealed it had a huge £1.5 million cash surplus, which consumer groups and politicians are now calling to be paid back to the public purse to cover the commission’s £2 million start up costs. Meanwhile the Community Safety Minister Fergus Ewing is, curiously in favour of seeing the SLCC’s £1.5 million go back into the pockets of his colleagues in the legal profession, rather than help keep afloat public & community services across Scotland. However, the Law Society are keen to counter any moves to pay back the money to taxpayers, and have opted for a combination of legal action, political intimidation and a public campaign by some of the Scottish legal profession’s more widely known, wider-mouth personalities against the very existence of the SLCC, hoping to force the Commission to refund lawyers the £1.5 million instead repaying the public purse to fund services such as health, education, justice, or community services. 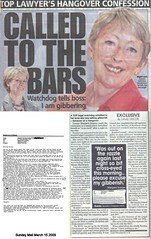 Jane Irvine revealed the Scottish Legal Complaints Commission faces costly legal action from the Law Society. From the SLCC’s media release of earlier this week. Jane Irvine, the SLCC’s Chair said : “Every new complaints body faces an early tranche of appeals over the first 3-5 years of its operation as powers are tested, and currently we are dealing with four Court of Session appeals, lodged by the Law Society of Scotland, under which the Law Society infers that they do not wish to investigate these particular conduct issues. Jane Irvine continued : “We must have sufficient reserves to defend legal actions and to be in a position to balance the strength of the legal profession as it raises appeals against the lesser strength of consumers, who will raise fewer appeals. We already know the SLCC is facing significant legal costs and, depending on the outcome of these appeals, we may need to change how the SLCC operates. The Law Society itself will not release comment on their legal action against the Scottish Legal Complaints Commission. Wednesday 24 June 2009 (Single Bills Extra Division) 3 Law Society of Scotland (represented by Balfour & Manson LLP) for leave against a decision of the SLCC. Tuesday 2 March 2010 (Single Bills Extra Division) 4 Law Society of Scotland (represented by Balfour & Manson LLP) for leave to appeal decision of SLCC. Wednesday 24 March 2010 (Single Bills Extra Division) 2 Law Society of Scotland (represented by Balfour & Manson LLP) against a decision of the SLCC (represented by Shepherd & Wedderburn). Community Safety Minister Fergus Ewing tells SLCC : Give lawyers a £1.5m refund or else we take away your independence. FERGUS EWING the Scottish Government's Minister for Community Safety has demanded the independent Scottish Legal Complaints Commission use its massive £1.5m surplus to lower the annual complaints levy which solicitors have to pay each year to cover the Commission’s costs of investigating complaints made by clients against their lawyers. The move has surprised many, as under the terms of the Legal Profession and Legal Aid (Scotland) Act 2007, the SLCC is independent of Government and the legal profession. Law Society of Scotland lobbied Scottish Government to reduce complaint levy which funds investigations against ‘crooked lawyers’. The unprecedented move by Mr Ewing, comes after the Scottish Government was lobbied directly by the Law Society of Scotland to intervene in the budget levy dispute with the SLCC, forcing a quick, quiet reduction of the complaints levy, after law campaigners and MSPs began to question why the Scottish Government had not asked the SLCC to repay its massive £2m formation costs to the public purse. Mr Ewing’s direct intervention on behalf of the legal profession, coming just a few weeks after I reported Mr Ewing had announced plans for Ministerial appointments to the Law Society of Scotland’s Council had been withdrawn after some more lobbying from the Law Society, is being widely seen as nothing short of Ministerial interference in an ‘independent’ body, particularly after Mr Ewing apparently issued a threat to review Ministerial powers over the Scottish Legal Complaints Commission if it does not comply with the Law Society of Scotland’s desire to see the complaints levy reduced. A legal insider indicated the Law Society had decided to push the matter after they had become concerned calls for the SLCC to repay its millions to taxpayers might gain ground, and scupper the chance of solicitors getting a refund on the complaints levy. He said : "Officials at the Law Society were furious some were suggesting the SLCC repay their £1.8 million start up costs met by the taxpayer and saw a real possibility this idea may gain ground particularly since the Commission is sitting on a £1.5 million cash reserve in a recession where the daily talk is of more cuts to public services. It has also emerged there are at least four cases in the Court of Session where the Law Society of Scotland are taking legal action against the Scottish Legal Complaints Commission over the Society’s remaining duties to regulate conduct complaints. A legal insider today alleged the Law Society’s lobbying of the Scottish Government under the circumstances of it pursuing the SLCC in the courts “is entirely inappropriate”. James Kelly MSP, (Labour) Glasgow Rutherglen. James Kelly MSP, a member of the Scottish Parliament’s Justice Committee queried whether the SLCC could justify its huge £1.5m budget surplus under current financial conditions. He said : "At a time when budgets are under pressure it is correct that questions are being asked as to why the SLCC need to retain a surplus of £1.5m. 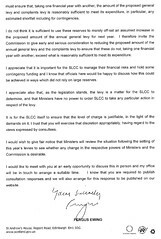 If the SLCC are unable to justify this surplus then consideration needs to be given to the steps required to bring the monies back within the remit of the general budget." Asked for reaction on Communities Minister Mr Ewing’s intervention on behalf of the Law Society of Scotland, a Scottish Government spokeswoman said: "The Minister is entitled to make his views known to the Scottish Legal Complaints Commission (SLCC), and any future changes which might be considered to ensure the SLCC operates efficiently and does not impose unnecessary burdens on the legal profession would ultimately be for Parliament to consider." An official from a Consumer organisation condemned Mr Ewing’s intrvention on behalf of the Law Society of Scotland while the Scottish Government had refused to help members of the public who had lodged complaints against ‘crooked lawyers’. Clearly the conduct of the Communities Minister Mr Ewing amounts to what many will view as Ministerial lobbying on behalf of the legal profession, coupled with a veiled threat of action if the aims of the lobbying (to reduce the complaints levy for solicitors) are not met. Scotland’s Lord President, Lord Hamilton. MCKENZIE FRIENDS for Scotland are back on the agenda next Tuesday 20 April as the Scottish Parliament’s Petitions Committee considers the latest submissions in what has become an increasingly bitter debate on the rights of party litigants, with Scotland’s top judge, Lord Hamilton appearing entrenched in his plans to heavily restrict the use & application of McKenzie Friends in Scotland’s civil courts, while consumer organisations & law reform campaigners lobby for a fair & equitable application of McKenzie Friends in Scotland comparable to their use for over forty years in the English courts system. The latest response on Petition 1247 McKenzie Friends for Scotland, from Mr Stewart MacKenzie, the petitioner himself, accuses Lord Hamilton of misleading the Petitions Committee on several issues, including that of whether McKenzie Friends have or have not (definitely have not) existed in Scottish Courts prior to Holyrood considering the question of formally introducing McKenzie Friends to Scotland. The petitioner’s letter also goes on to heavily criticise Lord Hamilton for planning to force the signing of certificates from those appearing in Scottish Courts as McKenzie Friends, a requirement which apparently does not in any other jurisdiction where McKenzie Friends are used. Lord Hamilton also intends an even stricter requirement that McKenzie Friends have an as yet undefined “relevant experience”, raising a further condition upon Scottish McKenzie Friends which does not exist elsewhere. Mr MacKenzie went onto say the Committee should make enquiries of Lord Hamilton regarding the independent evidence or research base to justify his requirements of ‘relevant experience’ before an individual could be approved as a McKenzie Friend in a Scottish court. Mr MacKenzie also tackled the shifting descriptions used by Lord Hamilton on the issue, where the Lord President has often preferred to refer to the McKenzie Friend as a “Lay Assistant” instead of the universally accepted “McKenzie Friend”. Mr MacKenzie and those involved in the debate have raised questions over the “Lay Assistant” term, which appears to have a much reduced status in law than an actual McKenzie Friend. Mr MacKenzie told the Parliament : “The process and procedure which Lord Hamilton now details in his 16th February 2010 letter, for bringing into force McKenzie Friends in June, refers to the words “Lay Assistant” and not “McKenzie Friend”. “McKenzie Friends” are so-called in Court jurisdictions from England & Wales to Northern Ireland, Canada, Australia and New Zealand. It is an internationally recognised terminology and I would urge the Petitions Committee to convey the strongest of views to Lord Hamilton that the distinctly Scottish term “McKenzie Friend” must also be used in the Scottish Courts system and not “Lay Assistant”. An official from one of Scotland’s consumer organisations spoke today on the increasingly murky debate over McKenzie Friends. Labels: Consumer Focus Scotland, Lord Hamilton, McKenzie Friend, Petition 1247, Scottish Government, Which? 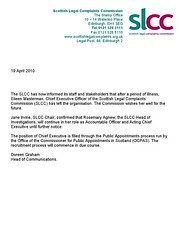 Insiders at the SLCC confirmed late yesterday evening Ms Masterman was leaving, apparently on grounds off “ill health” and that an official announcement would be made soon revealing Rosemary Agnew, the SLCC’s “Head of Investigations” as the new Chief Executive. SLCC's answers to Cabinet Secretary Swinney were far from clear. 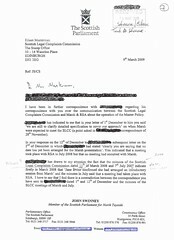 Ms Masterman’s responses to Mr Swinney's allegations of contradictions in correspondence between himself, a constituent and the SLCC, to keep secret any meetings with the insurers, fell through after details of the secret meetings emerged in board minutes of meetings of the Commission, leading to further correspondence between the SLCC & Mr Swinney, who went onto brand Ms Masterman’s explanations as "far from clear" after Ms Masterman informed Mr Swinney in letters dated 15 January 2009 "The SLCC has not consulted with Marsh or the Royal Sun Alliance about the operation of the Master Policy" which was contradicted by emails from November 2008 between Ms Masterman & the then Head of Investigations Rosemary Agnew, which read : "We received our tutorial yesterday on the Master Policy from Marsh". Eileen Masterman then wrote to John Swinney in a letter dated March 2009 claiming "I have not met with Marsh", clearly contradicting the course of events where SLCC officials including Ms Masterman had in fact met Marsh. The increasingly bitter exchanges on the issue of the SLCC’s involvement with Marsh continue between the SLCC, Mr Swinney and his constituent where legal insiders who have read the documents already available through FOI disclosures agree there appears to be a clear intention to mislead inquiries made by Cabinet Secretary Mr Swinney. The memos, written by Mr Mill and his associates at the Law Society depicted a sequence of events where officials including Mr Mill were apparently engaged in operations to target and deny clients any access to legal representation in cases involving the recovery of financial claims against ‘crooked lawyers’. The costs of claims against ‘crooked lawyers’ are met by the Master Policy, operated by Marsh and funded by insurers Royal Sun Alliance PLC. The Scottish Government & Scottish Legal Complaints Commission were both asked for comment today on Ms Masterman’s resignation. A spokeswoman for the Scottish Government said : “We do not comment on individual staffing cases.”. The Scottish Legal Complaints Commission did not give a comment at the time of publishing. Justice Secretary Kenny MacAskill. KENNY MACASKILL, Scotland’s Justice Secretary remained as tight lipped as ever in answers to questions raised in the Scottish Parliament over the abysmal performance of the SCOTTISH LEGAL COMPLAINTS COMMISSION, once hoped by many to repair much of the scandal surrounding the Law Society of Scotland’s notoriously corrupt closed shop client complaints process against its member solicitors, which has seen thousands of consumer complaints against Scottish lawyers swept under the carpet each year by the legal profession’s own self regulator. James Kelly MSP for Glasgow, Rutherglen (Labour) James Kelly MSP, Labour MSP for Glasgow Rutherglen and a member of the Scottish Parliament’s Justice Committee put several questions to the Scottish Government on issues of performance, expenses, budget and costs of the Scottish Legal Complaints Commission, which were answered by Justice Secretary Kenny MacAskill, who appointed the current board & staff to their positions at the SLCC. £2million of taxpayers money was lavished on the Scottish Legal Complaints Commission. 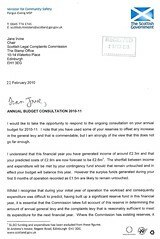 Amid calls for the SCLCC to be made to pay back , the public purse its massive formation costs, from its huge reserves of £1.5 million, the Justice Secretary refused to answer any questions relating to budget, expenses & costs of the Scottish Legal Complaints Commission, and simply stated any such enquiries should be made directly of the SLCC itself. Mr MacAskill in his replies to Mr Kelly appeared unwilling to disclose to Parliament, the millions of pounds of public funds lavished on the expensive, anti-client law complaints quango, which has now drained up to £2million from the public purse. The Justice Secretary also refused to confirm the extent of the SLCC’s massive surplus funds of £1.5 million, which are now also the subject of criticism from the Law Society of Scotland & the Faculty of Advocates. SLCC Board members claim staggering amounts of money on expenses while employed in other quango jobs at public expense. I reported on the extent of the costs to the taxpayer of the Scottish Legal Complaints Commission in an earlier article. here : Scottish Legal Complaints Commission refuse to repay £1.7million public funds as board member revealed to sit on Govt. Accounts scrutiny quango. In that article I revealed some of the SLCC’s members were claiming up to £15K a year in expenses while holding other well paid quango positions and ‘advisory roles’ to Scottish Government organisations. SLCC Chief Executive Eileen Masterman on a staggering £1350 a week, now absent for 6 months. The SLCC’s meetings from November 2009 onwards reveals its Chief Executive, Eileen Masterman, on a salary of £1350 a week, has apparently been absent from Board meetings and her post since late November 2009, being replaced temporarily in December 2009 by the SLCC’s Chair, Jane Irvine who from papers appeared to take on the Acting CEO role, which was then passed onto the SLCC’s Rosemary Agnew, according to the Board minutes for January 2010. James Kelly (Glasgow Rutherglen) (Lab): To ask the Scottish Executive what plans it has to review the performance of the Scottish Legal Complaints Commission. Kenny MacAskill: We have no plans to carry out a review of the Scottish Legal Complaints Commission at this time. It is too early to assess the effectiveness of the commission as it has only been operational since October 2008 and transitional processes remain ongoing. Under the Legal Profession and Legal Aid (Scotland) Act 2007, the commission is required to publish a report, as soon as practicable after the end of the financial year, reporting on the discharge of its functions in that year and such action as the commission proposed to take in the following year. Scottish Ministers laid their 2008-2009 Annual Report in the Scottish Parliament on 8 February 2010. James Kelly (Glasgow Rutherglen) (Lab): To ask the Scottish Executive what discussions it has had with representatives of the Scottish Legal Complaints Commission since its inception and regarding what issues. Kenny MacAskill The Scottish Government has been in regular contact with the Scottish Legal Complaints Commission on a range of issues such as the appointment of board members, the publication of the Commission's annual report, the Legal Services (Scotland) Bill and the transitional arrangements for complaints relating to the time before the Commission’s inception. Such discussions have been conducted on the basis that the Commission is largely independent of Government in how it fulfils its statutory responsibilities. James Kelly (Glasgow Rutherglen) (Lab): To ask the Scottish Executive what the cost has been to the Scottish Legal Complaints Commission of complaints that it has itself investigated. Kenny MacAskill: The Scottish Legal Complaints Commission is responsible for setting its budget and any questions about its costs and spending should be directed to the Commission. James Kelly (Glasgow Rutherglen) (Lab): To ask the Scottish Executive how much the Scottish Legal Complaints Commission has received from levies paid by the legal profession in 2009-10 and, of that income, how much has been spent on (a) running costs and (b) investigations. Kenny MacAskill: The Scottish Legal Complaints Commission is responsible for setting the levy and any questions about this should be directed to the Commission. James Kelly (Glasgow Rutherglen) (Lab): To ask the Scottish Executive whether the Scottish Legal Complaints Commission has a budget surplus. Kenny MacAskill: The Scottish Legal Complaints Commission is responsible for setting its budget and any questions relating to this should be directed to the Commission. James Kelly (Glasgow Rutherglen) (Lab): To ask the Scottish Executive who monitors the expense claims of board members of the Scottish Legal Complaints Commission. Kenny MacAskill: The Chief Executive of the Scottish Legal Complaints Commission is the accountable officer and is responsible for ensuring the propriety and regularity of the finances of the Commission and questions relating to financial monitoring should therefore be referred to the Commission. The Commission is subject to audit by the Auditor General for Scotland and is required to lay the audited statement of accounts before the Scottish Parliament. James Kelly (Glasgow Rutherglen) (Lab): To ask the Scottish Executive what the total amount of expenses paid to board members of the Scottish Legal Complaints Commission (a) was in 2008-09 and (b) has been in 2009-10. Kenny MacAskill: The Scottish Legal Complaints Commission is responsible for setting its budget and questions about its spending should be addressed to the Commission. Scotland’s top judge Lord Hamilton. THE CREDIBILITY of highly restrictive arrangements Scotland’s top judge, the Lord President, Lord Hamilton wishes to impose on the introduction of McKenzie Friends to Scotland’s Courts have been called into question for a second time after Consumer Focus Scotland launched a stinging attack on Lord Hamilton’s February announcement to the Scottish Parliament’s Petitions Committee in which he stated he had decided to finally allow, albeit with as some have dubbed ‘draconian restrictions’, the appearance of McKenzie Friends (the well known courtroom assistants to party litigants) in Scotland’s courts some FORTY YEARS after their introduction in England & Wales. English guidance has no force of court rules, raising more questions on overly strict Scottish conditions for McKenzie Friends : “While the Lord President appears to have based much, though not all, of his approach on guidance issued by the President of the Family Division of the Judiciary of England and Wales, we would emphasise that the guidance in England and Wales is entirely that: guidance. 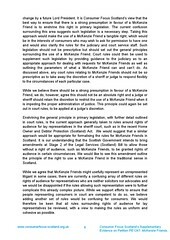 The approach in England and Wales does not have the force of court rules, and neither the McKenzie Friend, litigant nor the member of the judiciary are required to comply with the guidance. A retired Scottish solicitor who is in favour of the introduction of McKenzie Friends to Scotland, commented on the criticisms of the Lord President from Consumer Focus. However, an experienced individual with a legal background, who has successfully assisted many unrepresented party litigants in the English courts questioned Consumer Focus Scotland’s support for Lord Hamilton's proposal to ban Scottish McKenzie Friends from receiving payment for their assistance. A particular piece of case law from the English Family courts which supports the remuneration of McKenzie Friends for their services can be found here : N (A Child)  EWHC 2096 (Fam) Case No: FD03P02333 where the judge, Mr Justice Munby concluded “The father’s McKenzie Friend is entitled to charge, if he can find clients willing to pay his fees, at an hourly rate which can hardly be said to be extravagant when contrasted with the fees one frequently finds being charged to privately paying clients in family cases". The next hearing of Petition 1247 - McKenzie Friends for Scotland will be on 20 April 2010 at the Scottish Parliament’s Petitions Committee. Be there if you can, and please support the introduction of McKenzie Friends in Scottish courts on an as equal and fair basis as exists in the remainder of the UK. Labels: Consumer Focus Scotland, Lord Gill, Lord Hamilton, Lord Woolman, McKenzie Friend, Petition 1247, Scottish Government, Scottish Parliament, Which?